Sunday Best season 7 winner. Sunday Best season 7 winner is Geoffry Golden. The finale was filled with great performances from Hezekiah Walker, Tamela Mann, Marvin Sapp, Ricky Dillard, Joe and Yolanda Adams. Cleveland Heights High School graduate Geoffrey D. Golden, a gospel singer from Northeast Ohio. Golden’s BET profile says: “Geoffrey is known in local gospel circles for his powerful and anointed voice and his passion for gospel music and Jesus Christ. He states that ‘being on “Sunday Best” means that God is faithful to do all that He has promised even if you don’t see how or when He’s going to do it. 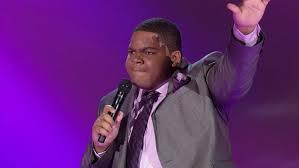 If God said He has greater for you, then you will see greater.’ Geoffrey, a junior at Morehouse College served as the student director and lead vocalist of the Cleveland Heights High Gospel Choir. He was student director of the Acapella Choir and a member of the All-State Choir. Geoffrey is the National Praise and Worship Leader for the Churches of Christ (Hol.) USA. He is a member of the Greater Cleveland Choral Chapter of the National Convention of Gospel Choirs and Choruses (NCGCC) and sits on the Board of Directors of the NCGCC.” Geoffrey is a songwriter, director, musician and orator. He is a member of the Glenville Church of Christ Holliness USA, where his father, Kevin D. Golden, is the pastor. Congratulations Geoffrey, this is the first of the best days of your life.